June | 2011 | ___is black the new black? IMG_0013, a photo by mlzafron on Flickr. 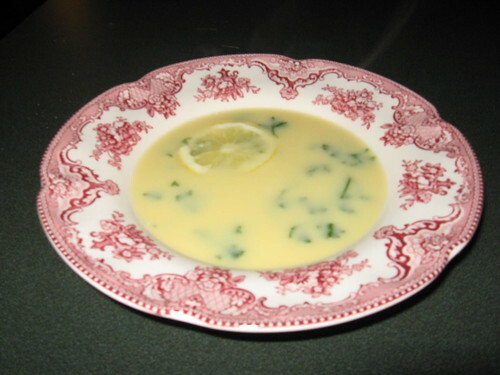 I was looking for a nice light summer meal option and came across this recipe for Avgolemono (Greek Egg Lemon Soup) in my copy of the Silver Palate Cookbook. You boil the chicken stock/broth and add in the rice, lowering the temperature so that it’s simmering. You cover the pot and let it cook for about 25 min. Once that’s done, you take the pot off the burner and in a separate bowl whisk the yolks and lemon juice. Then you temper that into the chicken broth so you don’t end up with lemon scrambled eggs. You add a couple of lemon slices and some parsley and serve. You can also chill it and serve it cold. The only drawback is that this does not reheat well.